Most people love tattoos and get them as soon as they legally can. But what do you get inked on your skin forever that you'll never regret? Well, for one you don't want to get your boyfriend's name - who knows where that's going to lead. Instead, go for something safer — like your zodiac sign in astrology. 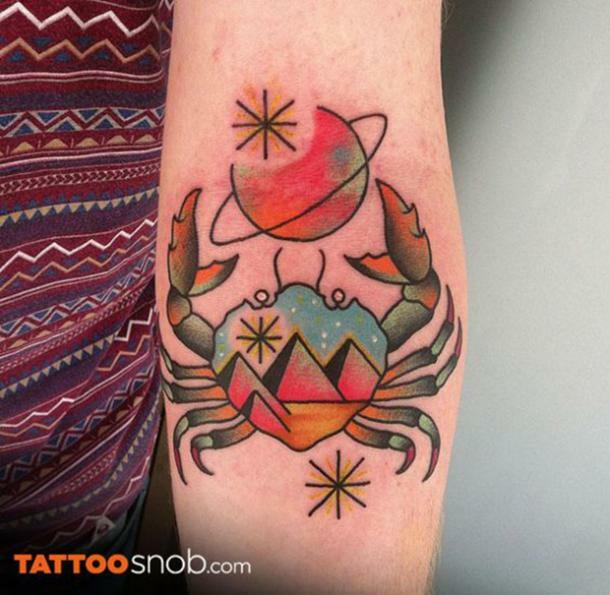 If you're a Cancer zodiac sign, you have TONS of options and tattoo ideas to choose from. 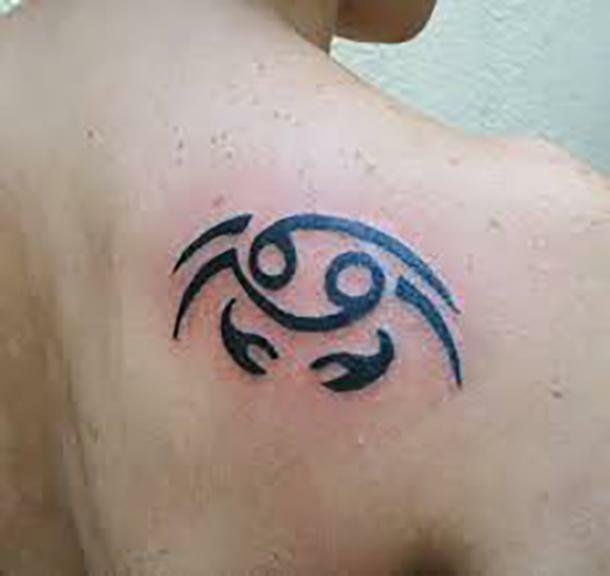 From crabs to constellations to other forms of symbolism, you can get as complicated or as minimalist as you want. Good tattoo ideas can be hard to come by. Take me for example — I made a promise to my younger cousin that I would wait for her 18th birthday so that we can get our first tattoos together. Of course, they will be matching tattoos. But I’ve got another two years to either chicken out or decide on the tattoo. And it's intimidating, to say the least. Fortunately, I’m lucky to have an artist in my family, so she’s always drawing up the best tattoo ideas. And lucky for you, Cancer tattoos can be some of the most creative pieces of art around. 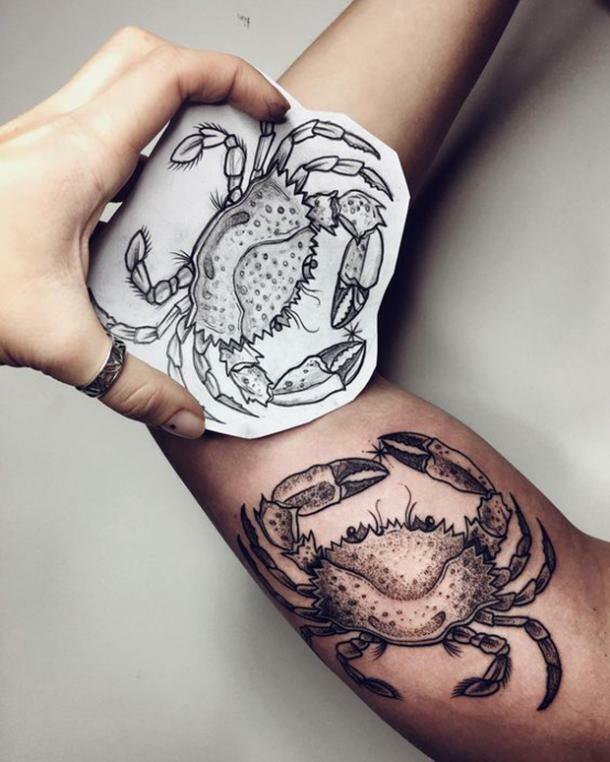 Crabs are intricate, beautiful creatures already, but mix them with some stars and modern tattooing techniques, and you can come up with some really cool, unique art of your own to carry on your skin forever. So look to these 30 tattoo ideas below for some inspiration and to get the juices flowing, then DO IT! Just take the plunge and get yourself a custom piece of art for yourself. Trust me - you won't regret it. 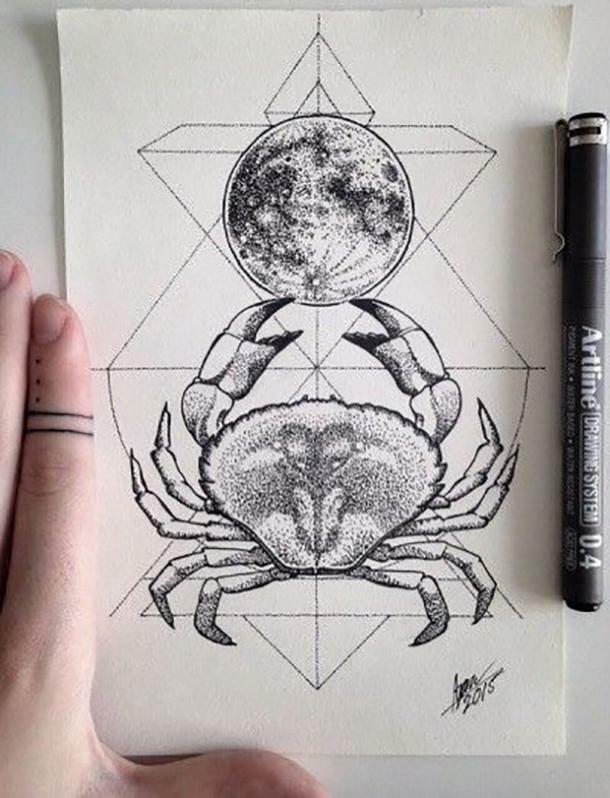 This dreamy work of art is representative of Cancer's planetary ruler, the moon. This is a romantic tattoo that the sensitive Cancer will love. I'm not sure what a Crab's vision is like. But, I do know that this colorful tattoo is sure to pinch anyone's attention. This is another colorful tattoo and it's perfect for space lovers too. For someone with a Cancerian wonder, the sky's the limit and the moon is in their grasp. 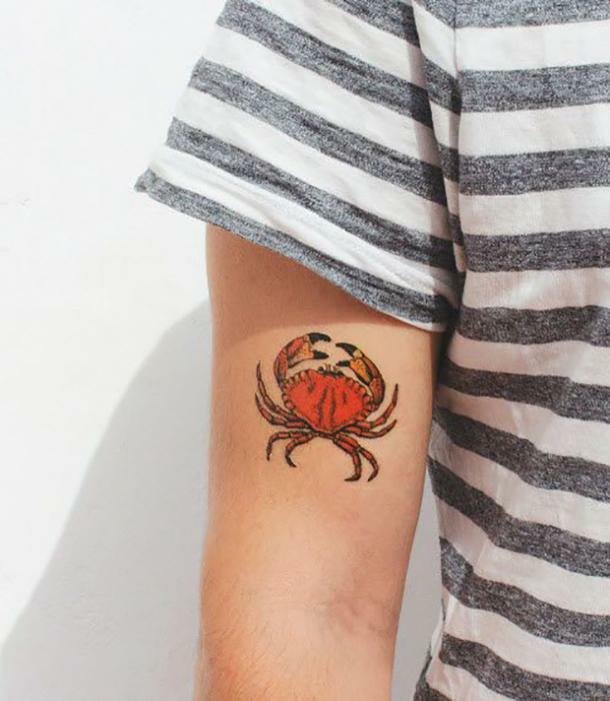 You don't have to go all out with your crab tattoo. 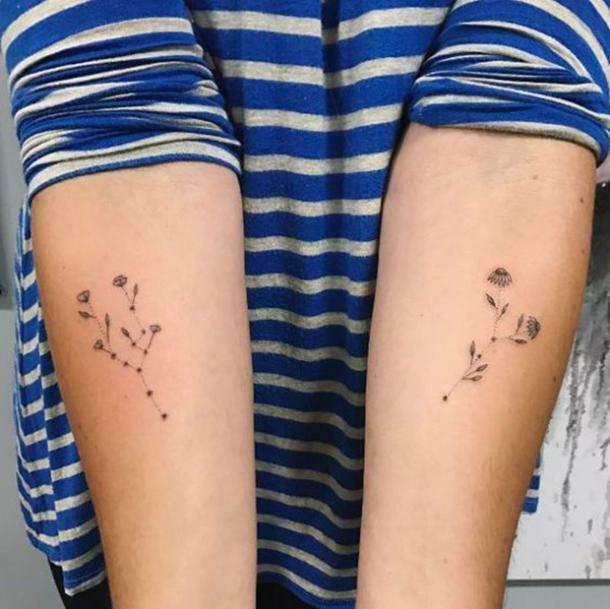 You can get a simplistic drawing of one on your skin and call it a day. 6. Imagine playing footsies with a crab...unintentionally. 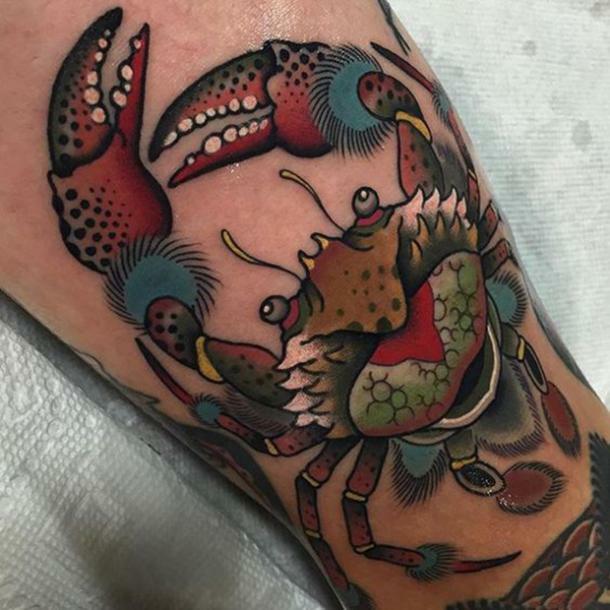 This tattoo looks like Mr. Krabs. It's a pretty simple tattoo but it's a great one for people who don't want to be covered in ink. 8. Another great first tattoo that's simple, yet unique. Is it an upside down Y or is it another Cancerian symbol? People will have to...connect the dots...with this one. 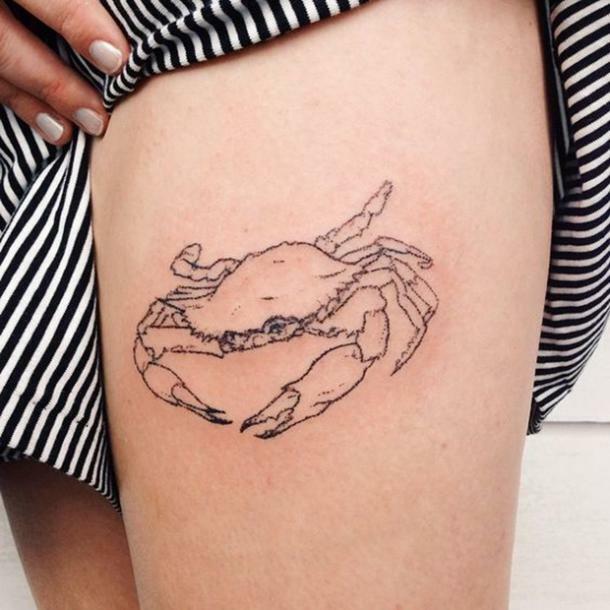 This crab tattoo is a wild choice for braver people. It's also got an other-worldly vibe to it. 10. Perhaps, you don't like color all that much. This would make a better tattoo for you if you're not into wild things. Maybe you don't want color but you like something intricate. 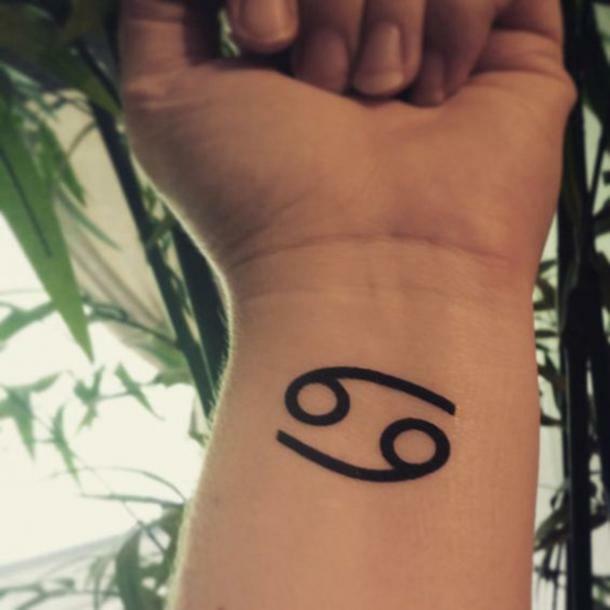 This tattoo is not only complex but also a good reminder that the moon is in your hands. 12. 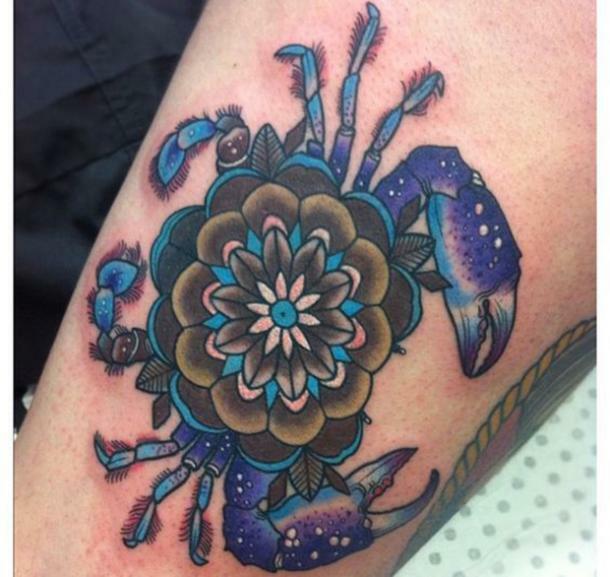 Perhaps, you love the color blue and flowers - why not incorporate that in to your crab tattoo? What if you're hard on the outside and soft on the inside? 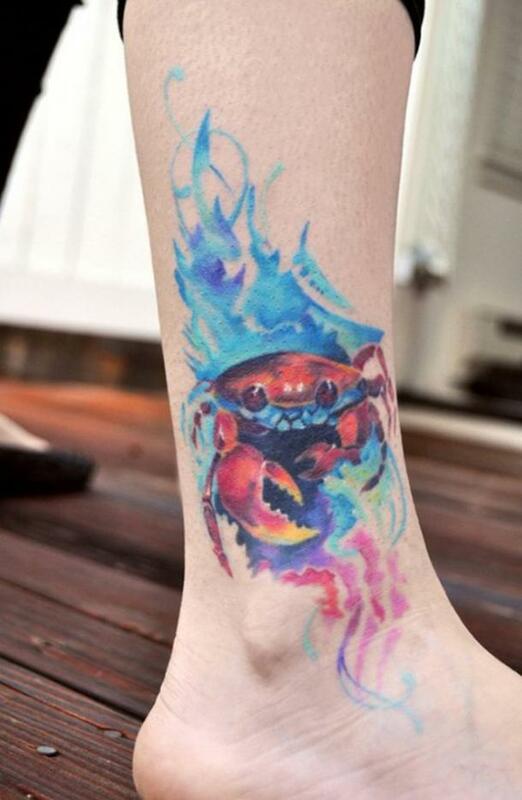 This crab filled with flowers is the perfect tattoo for you. 14. 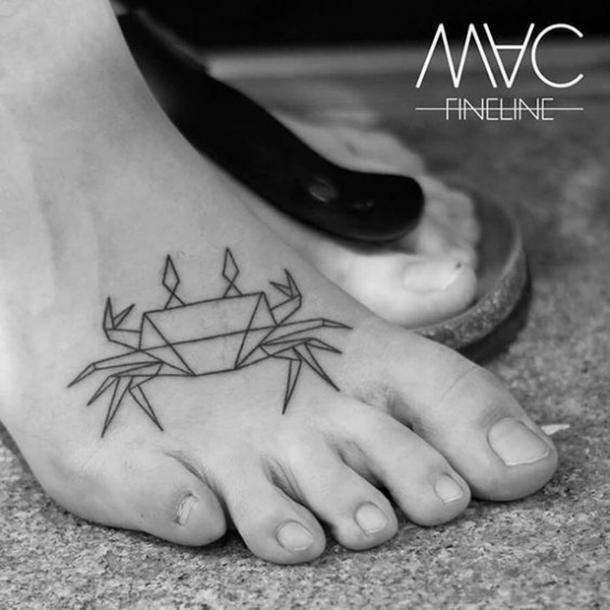 A feminine foot tattoo related to your zodiac sign. This tattoo is the perfect one if you like something less black or elaborate. It's like the one above but for people with simpler tastes. Perhaps, you want a symbolic tattoo that's classier or easier to hide. 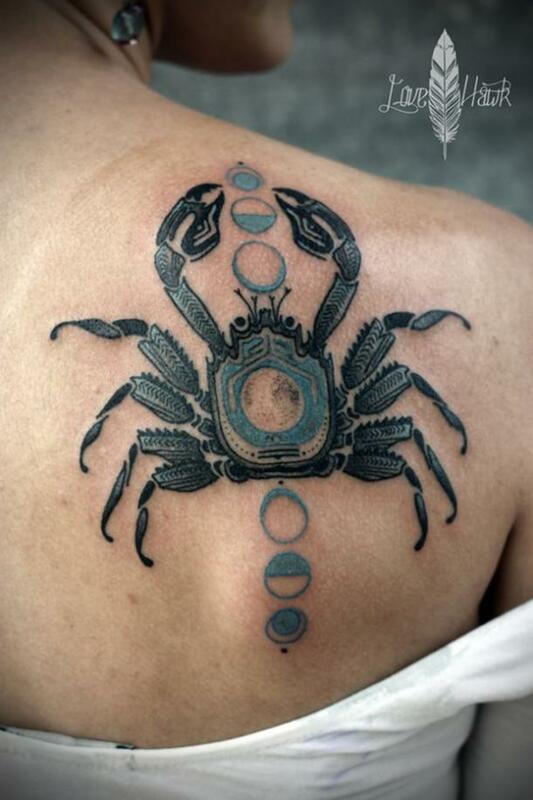 This tattoo with a Cancer zodiac mixed with a musical vibe is the perfect one for you. 16. Maybe you want lifelike and geometric all in one stunning tattoo. Maybe you can't decide between something fuller or something simpler. Why not have both in one tattoo? 17. Here's another tattoo that's a combo. 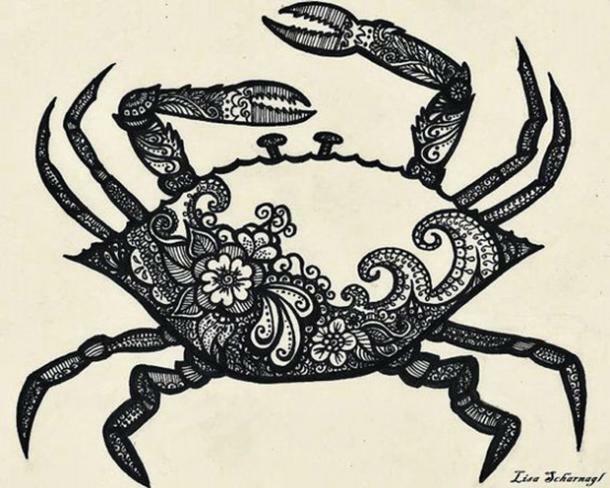 Perhaps, you like crabs and tribal tattoos. This combination is both in one. 18. 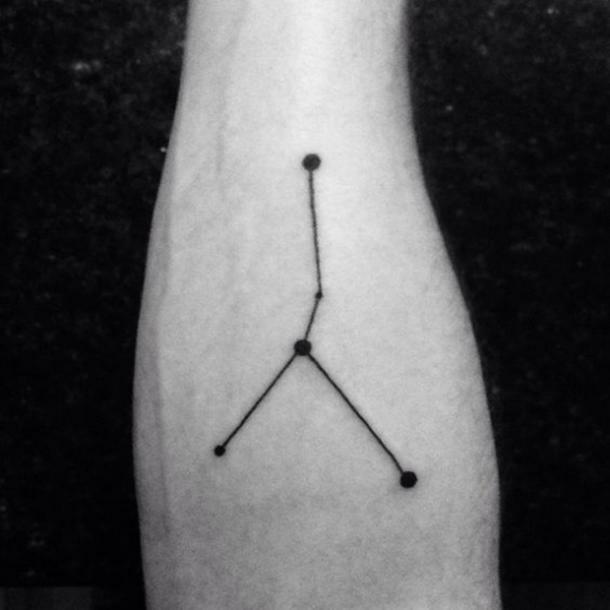 A simple, yet unique, version of a zodiac constellation tattoo. If this tattoo looks familiar, it's because it's already made this list. This second option is a little more feminine and has a little more flare. 19. 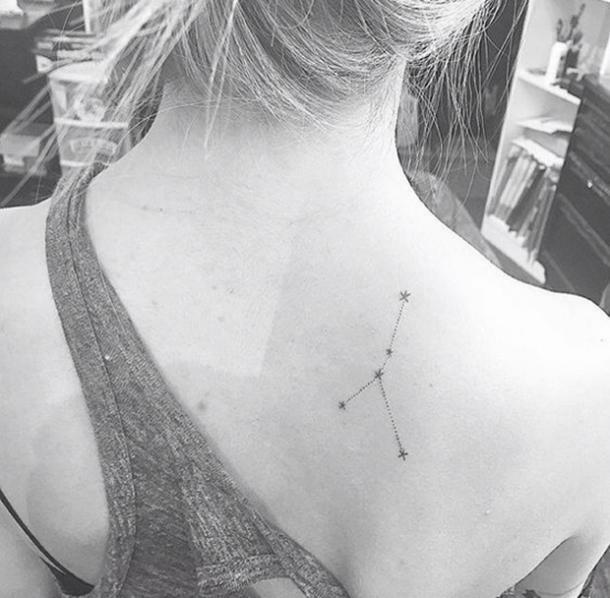 A perfect back tattoo paying homage to your zodiac sign. 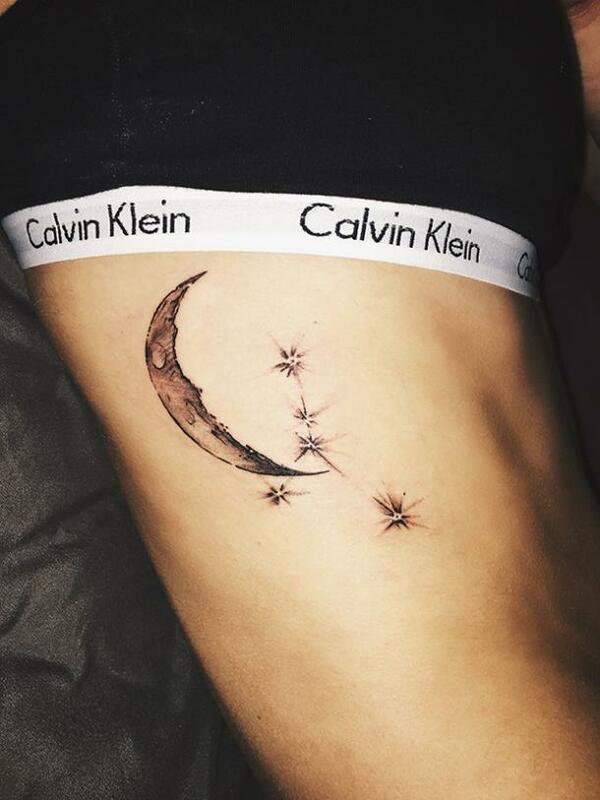 Maybe, you like the above tattoo but want something even more stripped. 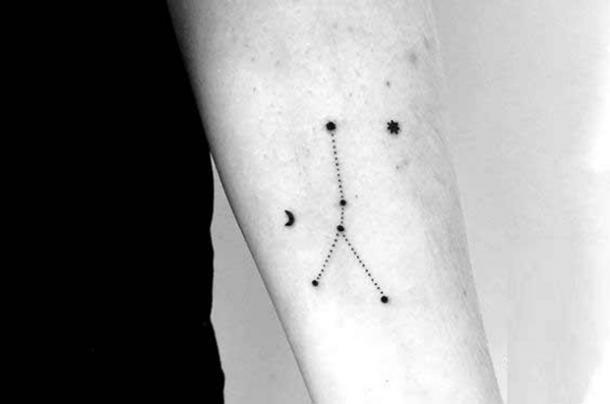 This tattoo connects the stars around it rather than dots. 20. 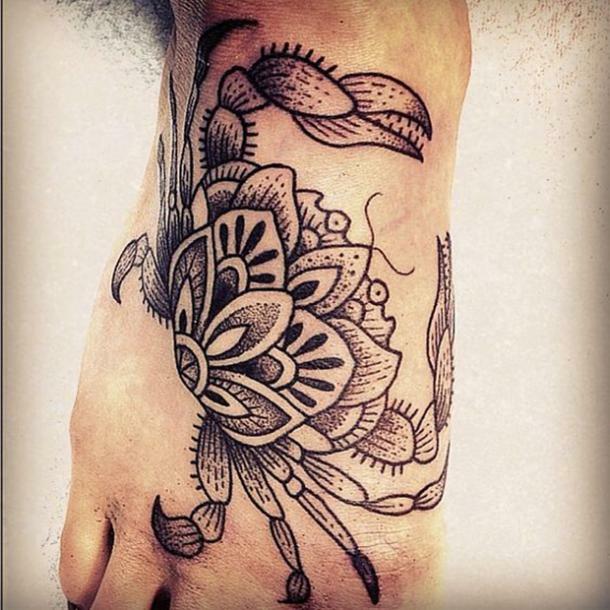 A dotwork tattoo is a stunning addition to your ink collection. 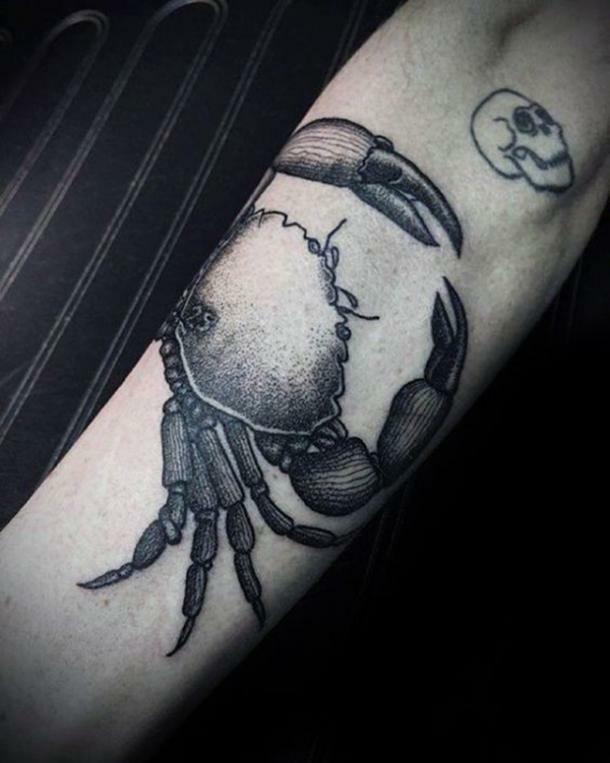 If you want something darker and modern, get a black dotwork crab. 21. 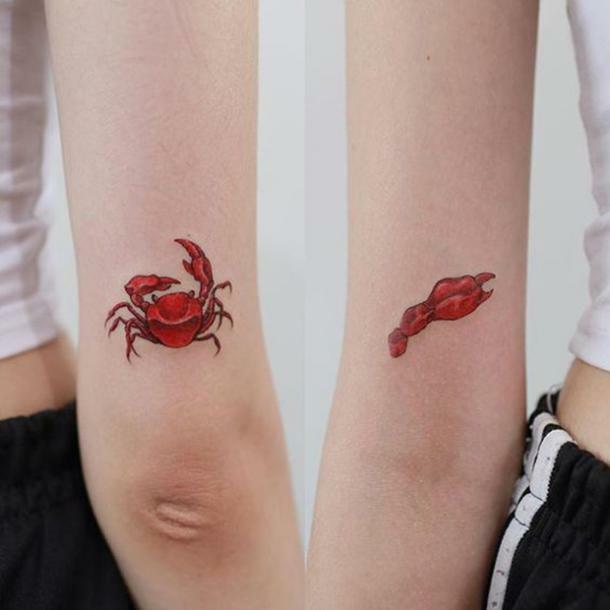 A red crab tattoo for your arm. Maybe you like the color red. 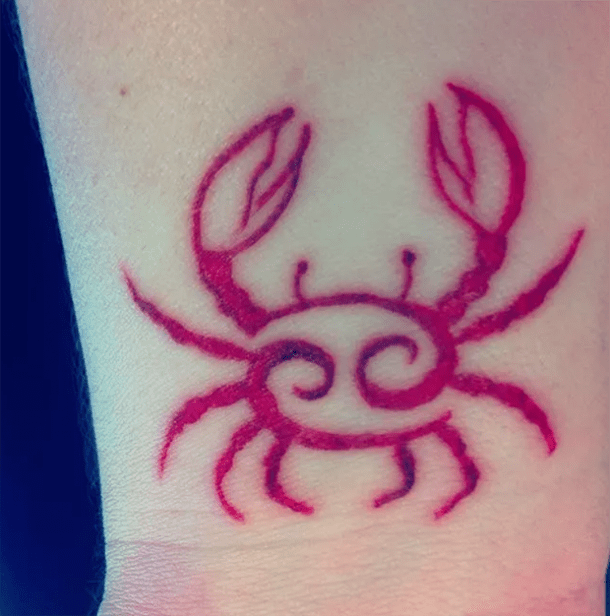 Get this simple red crab tattoo. 22. 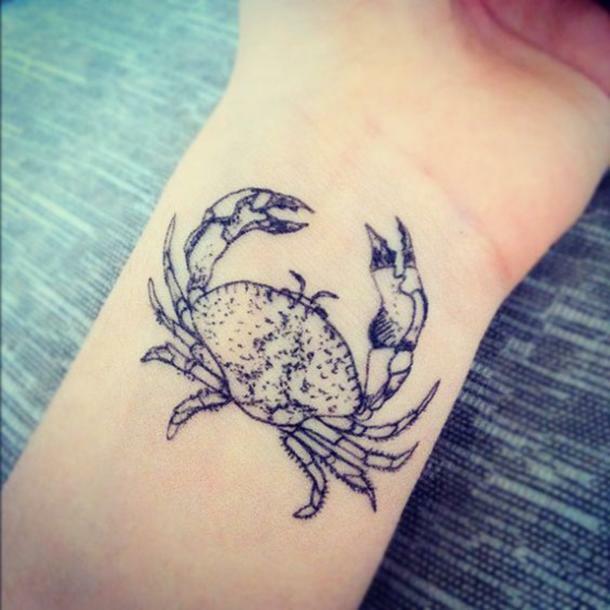 A small wrist tattoo of a crab. Get this minimalist tattoo if you like something that's easily hideable. 23. If you want to make a point. 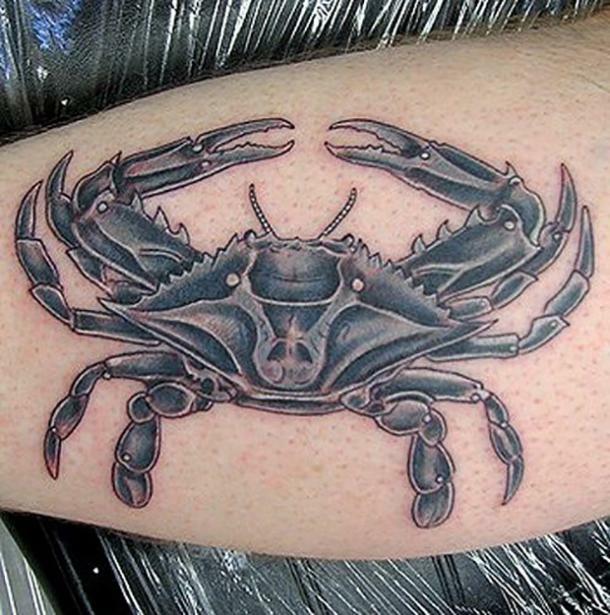 Get this extra edgy crab tattoo. It's soooo...sharp. 24. You can also get this design if you like nature. Is it a flower or is it a Cancerian symbol? It's both and you should get it if you like flowers. 25. Perhaps, you like green. If you like green as much as Mr. Krabs like it, get this tattoo. 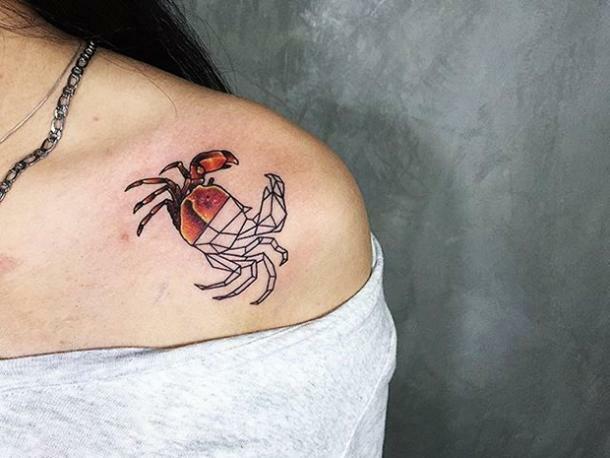 This tattoo is full of green — but don't tell Mr. Krabs. 26. 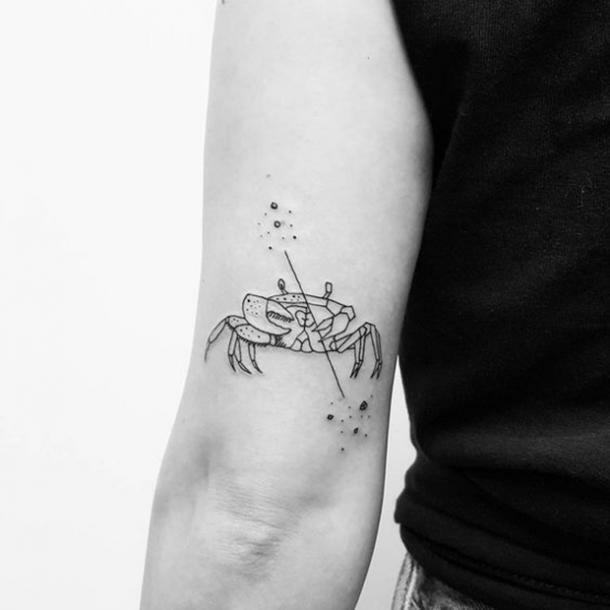 Another simple linework tattoo for crab lovers. This tattoo is a simple and avoids being over the top at the same time. 27. 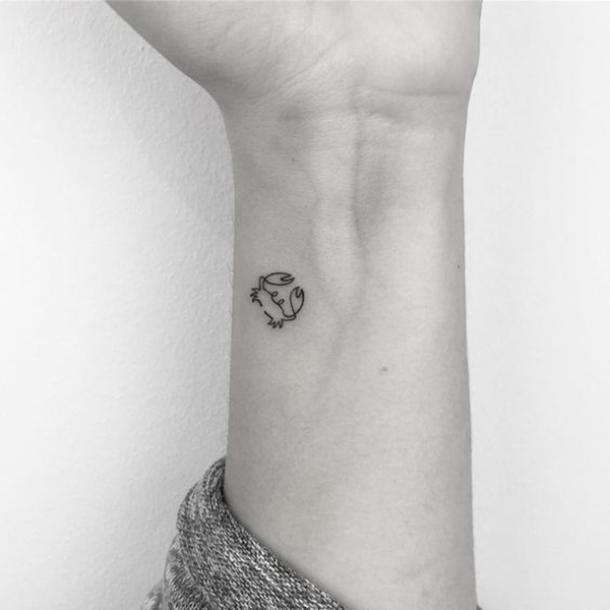 A cute small tattoo on your wrist. This one is also a minimalist design and easy to hide. 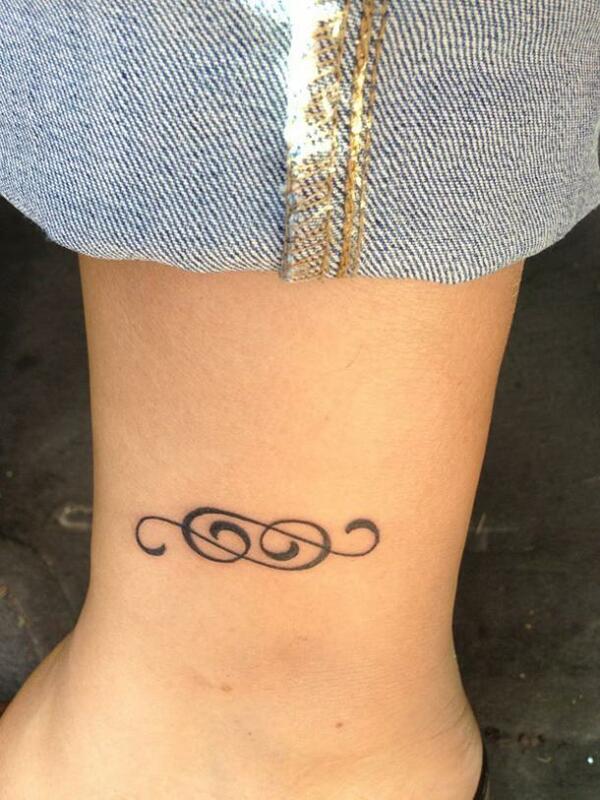 It's also super cute as a first tattoo. 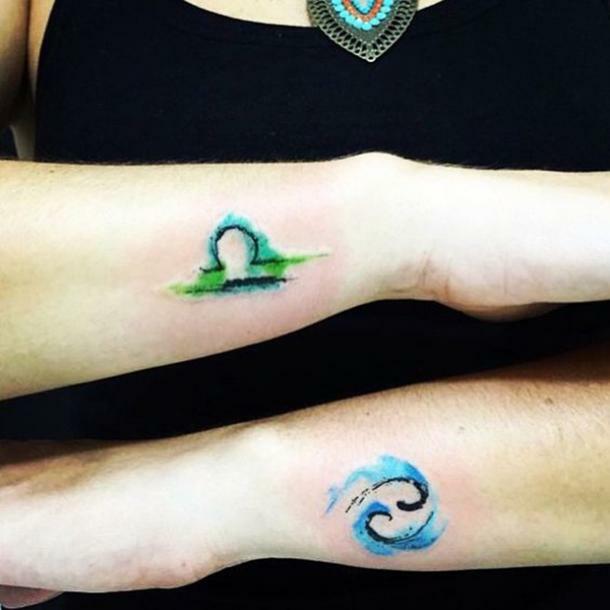 You can get these tattoos with a partner of your own zodiac signs. They're cute and colorful but easy to hide if needed. 29. If you let your hair down. 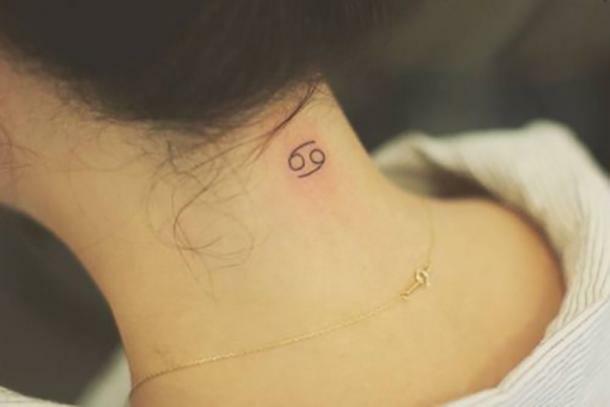 You can totally hide this classy neck tattoo if needed. If you want to rep your sign and not get in trouble, get this pretty tattoo on your neck. 30. Perhaps, you want to be bolder. Get the above tattoo in bold and on your wrist. Be loud and proud about your love for Cancerians. Camila Isopo Novi is a fiction writer and journalist who loves babies, reading the comments (even though they say writers shouldn't), and hopes to win the lottery one day.